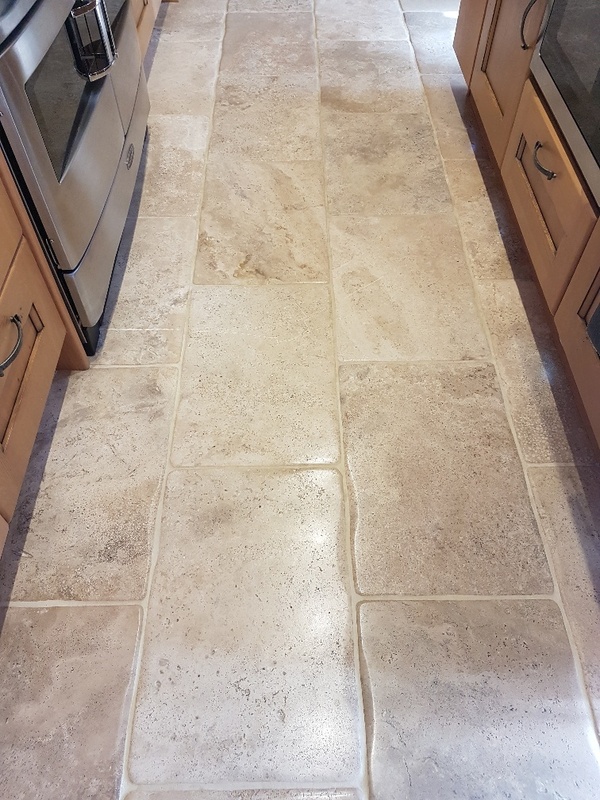 The photos below show a beautiful Bullnose Travertine tiled kitchen floor at a property in Pateley Bridge which needed professional attention as a consequence of being protected by a cheap and ineffectual sealer. 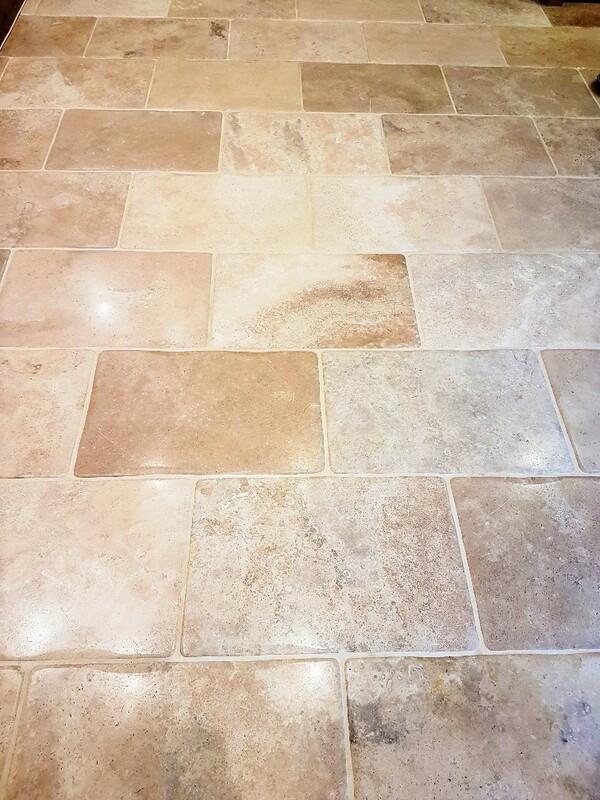 The problem was that sealer that had been applied did not provide resistance to UV rays, and the exposure to the sunlight had turned the Travertine tiles an unnatural yellow colour. 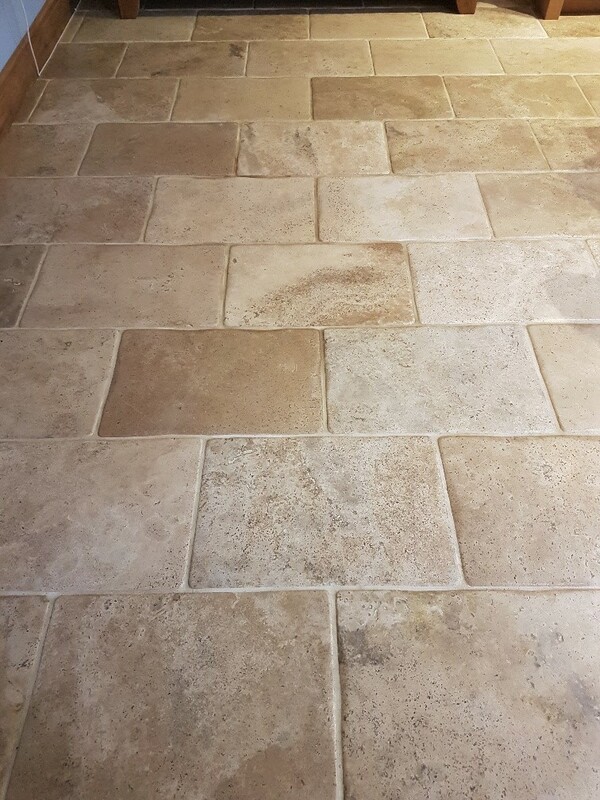 Over time the sealer had gradually worn away in the busiest areas, so it was less noticeable but of course without the protection of the sealer the stone then became exposed to ingrained dirt and stains. I took some pictures however they don’t really show the problems that well but needless to say, the property owner was very keen to have the situation rectified – which of course is where I came in. I travelled to Pateley Bridge, a small market town in Nidderdale in the Borough of Harrogate, North Yorkshire. What is a ‘Bullnose’ tile, you say? Well, it simply refers to the trim of the tile. While traditional tiles will have a straight edge, a Bullnose tile will have a slightly rounded or curved edge. To begin the restoration, I deep cleaned the tiles mechanically using Tile Doctor diamond burnishing pads starting with a coarse grit. These pads served the purpose of grinding away the very top damaged layer of the stone, effectively removing the yellow staining, grease marks and any old sealer. You use a little water to help lubricate the process and this soon becomes soiled and needs to be rinsed away and removed after each pad is applied. Next, I cleaned all of the stained grout lines by hand. 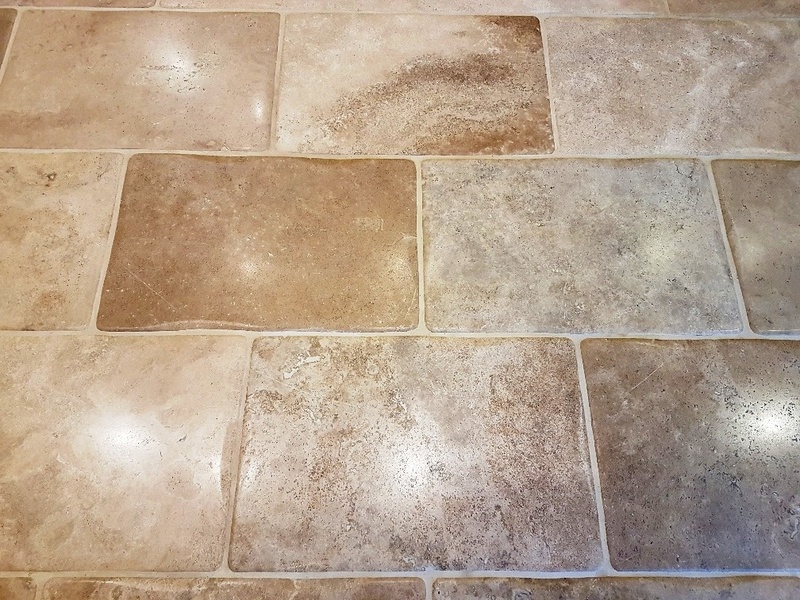 I did this using Tile Doctor Pro-Clean, which is a reliable, alkaline-based cleaner for use on both natural stone tiles and grout. I mixed the Pro Clean into a solution of one part cleaner to three parts fresh water and worked it in by hand using a stiff brush along the grout lines. Once done the now dirty cleaning solution was rinsed off the floor and extracted leaving the grout fresh and clean. To finish the cleaning process, I polished the floor with a 3000 grit (very fine) burnishing pad to leave the tiles with a silky satin finish. This pad is applied mechanically with a little water in a technique we often call a spray burnish. Once the floor was dry it needed protecting to ensure that dirt could no longer penetrate the pores of the stone. So to guarantee that this wonderful satin finish would last, I sealed the tiles with two coats of Tile Doctor Ultra-Seal. 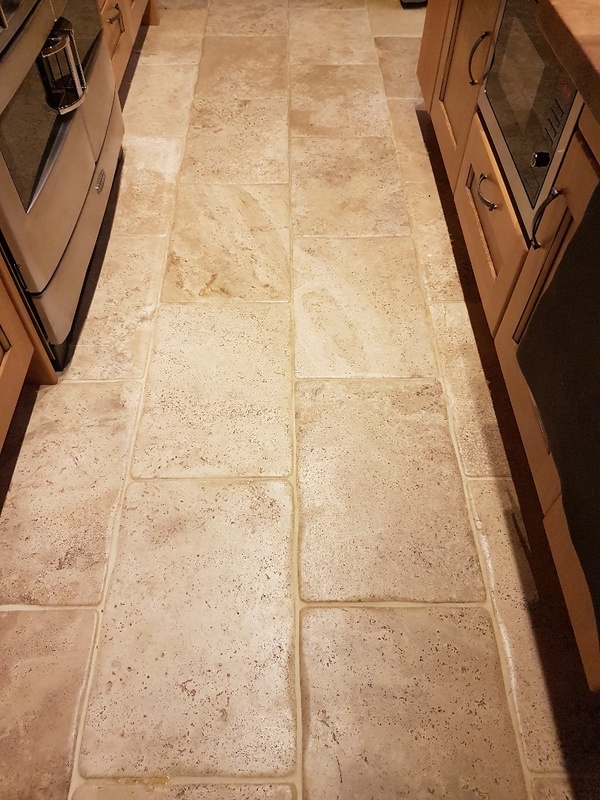 Ultra-Seal is Tile Doctor’s premium impregnating sealer which is formulated to provide maximum stain protection, especially in food preparation and serving areas such as the kitchen. The photos above show the outcome of the restoration, I appreciate my photograph skills are not the best but hopefully you can notice how much healthier the stone looks now, compared to the yellow, sickly appearance of the stone before.